Blisters can quickly ruin a perfect day in the backcountry. Blisters can happen to even the most experienced hikers and most prepared backpackers, but there are a few simple tricks to prevent blisters before they ruin a hike and minimize discomfort when they occur. Here we will share what works for us, and we'd love to hear what works for you in the comments below! Prevention is often said to be the best medicine and it holds true for blisters. Properly train for any big hikes or extended backpacking trips, to allow your body and feet to build up the toughness required to handle long days on the trail. By completing several prep hikes, of increasing distance and difficulty, you will be less likely experience problems with blisters. Footwear is the most important piece of equipment you will purchase for hiking and backpacking. Carefully choose a pair of hiking footwear that is right for you. Some hikers swear by heavy duty hiking boots, while others prefer a minimal hiking shoe or trail runner. Whichever style you prefer, wear a new pair around town, to the office, and on a few short hikes to break them in. A big hike is the wrong time to try new hiking footwear. Give your footwear a proper break-in and you will be far less likely to experience discomfort, hotspots, and blisters on the trail. Socks are nearly as important as your hiking footwear. Make sure your socks fit well, without being too tight. A hiking sock that wicks moisture, dries quickly, has no irritating seams, and made with a soft material is one of the keys to avoiding blisters. Cotton socks are a big mistake and should be traded in for a wool, or synthetic sock designed for hiking and backpacking. We recommend a merino wool sock when hiking because it naturally keeps feet dry, blister free, and is softer than synthetic fibers. CloudLine merino wool hiking socks are a great option for keeping feet dry and blister free while hiking and backpacking. Sometimes blisters happen. You have a painful blister forming, what do you do now? Let's look at some tricks and tips to help treat blisters mid-hike. When you start to feel a hotspot or blister forming the first thing you should do is change your socks for a fresh dry pair. Even the best hiking socks can become too wet if your footwear isn't breathing well, or you accidentally step in a stream. A dry pair of socks will keep your skin dry and reduce friction as you hike. If you are backpacking and packed a pair of camp shoes or hiking sandals, try wearing them to give your feet a break from your hiking footwear. However; this should be done with caution as they will not provide the same support as your hiking footwear. Be sure to pack first aid items specifically for treating blisters. Moleskin is one of the best known remedies, but we prefer some of the more modern blister products like 2nd Skin blister pads because they come pre-sized and ready to apply. If these aren't available to you, a bandaid from your first aid kit is better than nothing and can often protect a hotspot enough to prevent a full blister from forming. A great way to make the dressing you've applied stay put is to cover it with a layer of duct tape (just be sure the duct tape isn't sticking to any problem areas). Skin lubricants can also help prevent hot spots and blisters from developing. Rubbing Bodyglide or similar products on high friction areas like your toes and heels before a long hike will add a layer of protection to your skin and make blisters less likely. We've even seen people use sticks of deodorant for this purpose. Just be sure to let any lubricant dry for a few minutes before putting on socks. Hopefully, you'll won't often get blisters, but when you do having one or all of these options in your pack will feel like a lifesaver. Wool-It is an innovative all-natural blister treatment made from wool. It has the same properties and benefits your merino wool hiking socks have. Feel a hot spot forming, simply fluff a bit of wool and stuff it around the spot and it will provide a protective cushion that wicks moisture to keep things dry and friction-free to prevent a full-blown blister from forming. Spenco 2nd Skin Blister Pads are a great option for preventing a hotspot from turning into a blister or to protect a fully formed blister. We've put one on the first day of a 5-day hike and it stayed in place through 4 more days of hiking and even withstood daily swims. Body Glide FootAnti Blister Balm can be applied directly to trouble areas pre-hike to prevent friction or mid-hike when you feel a hot spot coming on. It has long been a secret weapon for triathletes and ultra runners but works great for hikers too. There is a long-standing debate about whether to pop a blister or leave it alone. As a general rule if the pain is preventing you from hiking it is best to drain the blister. Thoroughly disinfect and clean the area around the blister with soap and water, an antiseptic wipe, or an alcohol wipe. Sterilize a needle or sharp knife by boiling for a few minutes or holding to a flame until red hot. After letting the needle or sharp knife cool make the smallest incision possible to drain the fluid. If the blister is on the heel or top of the foot, make the incision at the bottom of the blister so that gravity can help it stay drained. Apply antibiotic ointment and bandage as you prefer. 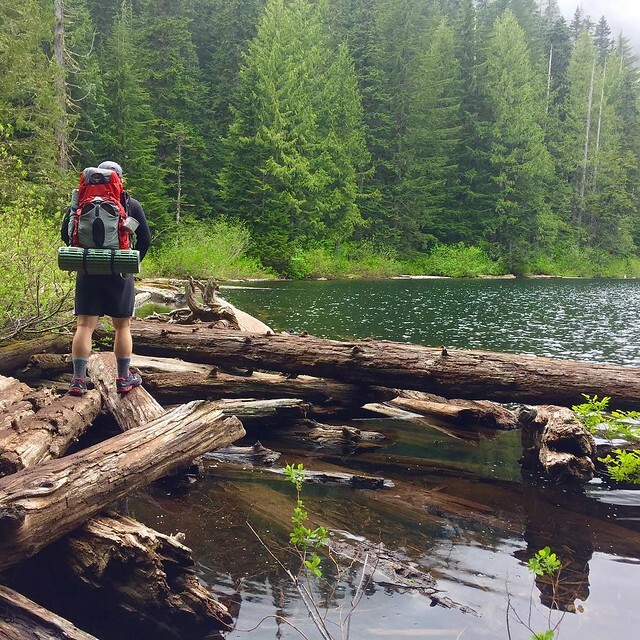 Now that you know how to avoid blisters, read our backpacking tips for beginners post. Antother tip that worked well for blisters when hiking, is to use a sterilized needle with tread that is dipped in "tea tree " aromatherapy oil.Insert the needle gently into the blister just under the skin,and pull it through with the thread at another end.The fluid will be absorbed on the tread as it is pulling through.Swelling of the blister will relieved,and gone the next day. Epsom Salts will burn like a #&*@# BUT it basically “cures” your feet like salt cured meat and stops infection and dries out blisters if you do get in bad shape during a hike. Very inexpensive first aid. I use a liner sock from Australia called ArmaSkin that keeps my feet dryer and fresher and no blisters. Always wear a liner sock! A thin polyester under a thicker wool sock will prevent blisters by causing friction between the two socks, not your skin and the wool sock. This is the best tape to use- http://kingbrand.com/KB-Support-Tape.php?REF=34PV173 – It is medical grade compared to most on there. Can get direct through link or on amazon. This support tape is the best I have used. I did the Portuguese Camino de Santiago (130kms). Each day I applied Vaseline petroleum jelly on my feet. Happy to say, not one blister! I’m a male and used to get blisters! I was advised to always buy woman’s boots (narrower ankle) which I did and no more blisters! Its a bit more than just that however. when I stop to rest I always take my boots and socks off, wipe my feet with a wet flannel (special colour) and let dry, massage for a short while, turn my socks inside out and then put them back on. No need to splurge on this and that, to me its just marketing myth! I always where inserts (in my case Sorbothane) for shock absorption. This combination of products and routine works for me, haven’t had a blister for years! I’m a big advocate for putting petroleum jelly on your toes and other problem areas. I rarely get a blister when I use it. Applying a thin coat of Vaseline to yor feet skin before you put on your socks is really helpfull. I did Saint James path (Camino de Santiago) walking around 30 kms a day and my feet were perfect. Hope this will be usefull. ‘Duck tape’ is in fact Duct Tape.